while i was taking my class at close knit, i had fun wandering around touching the different yarns, admiring the colors and varying degrees of softness, learning about weights, the usual “getting to know this new medium” type stuff. and then i found a yarn that was so perfect for my little gal and decided to make her a hat even though she didn’t need one. it’s pink, but it’s also rainbow-y! it’s soft, it’s worsted weight – lighter weight yarn than i’d ever knit with before, but not so tiny it was scary…it was perfect. it’s the first “real” yarn i bought and yes, good yarn makes a big difference (just like good fabric does while sewing!). 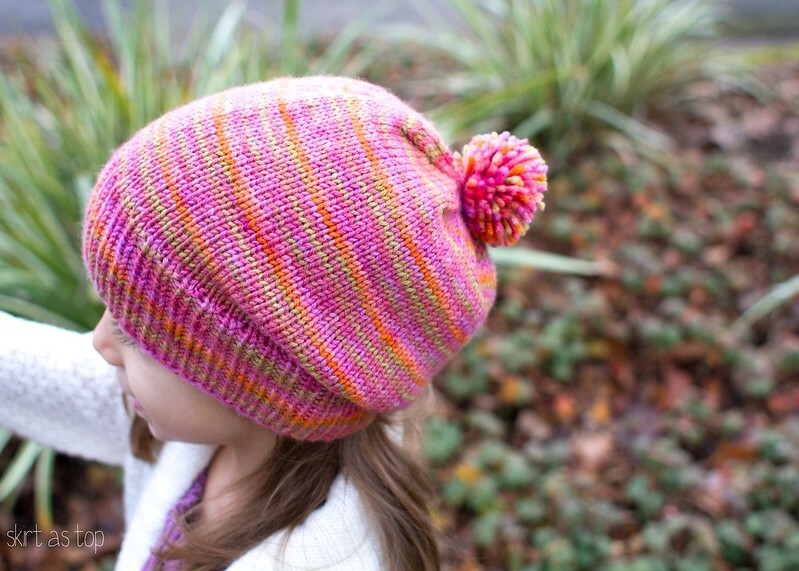 it’s by cascade yarns – superwash paints in rainbow sherbet and i loved knitting with it. 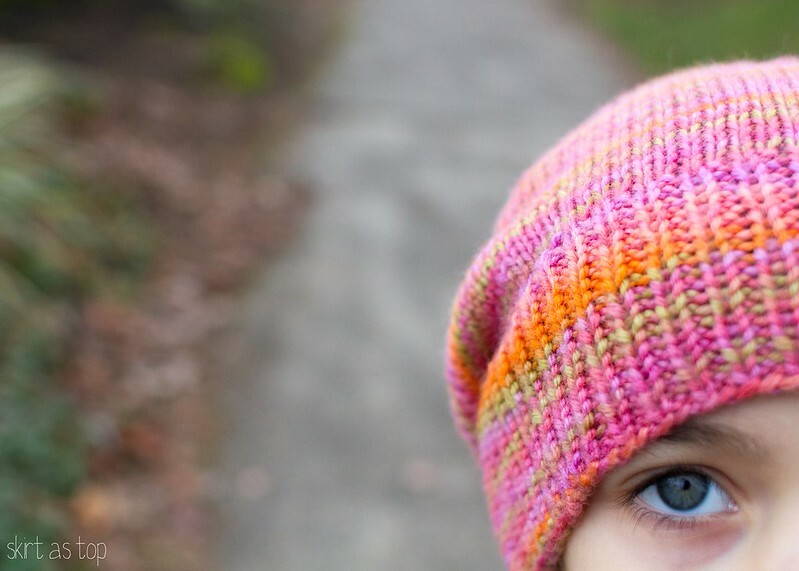 i thought it’d be cute to make her a slouchy beanie, and asked Tara what pattern she liked – she suggested the Graham (free on Ravelry). my teacher said by age 5 or 6 a kid can wear adult hat patterns, so i cast on the adult medium size from the pattern started work on the ribbing. 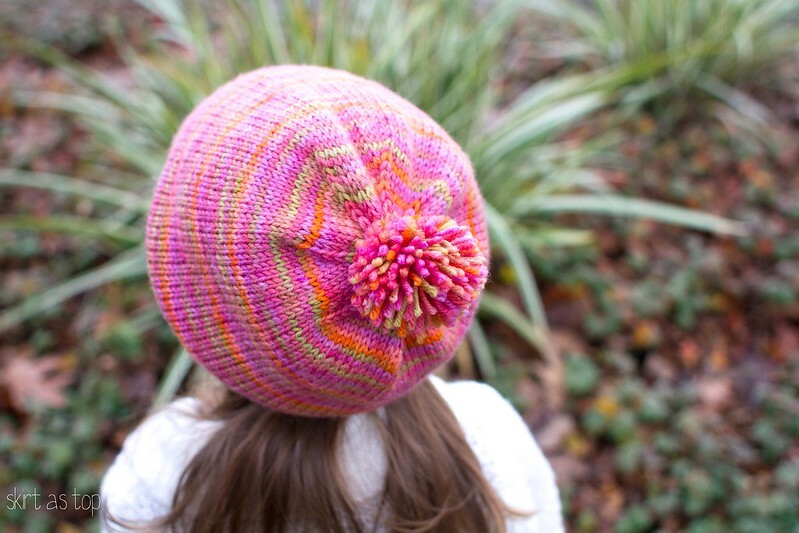 at a certain point, i decided i didn’t need the broken rib texture to add interest to the main body of the hat – the yarn had so much going on color-wise, i stuck with my sewing philosophy of “loud fabric? use a simple pattern” and hoped it’d apply to knitting too. i blocked the hat and let it dry overnight with the crown stretched over a dinner bowl (my first time blocking!). it definitely helped add to the slouchiness, though it stretched out the brim a little more than i wanted. it still fits her fine, just a teensy bit loose. oh! 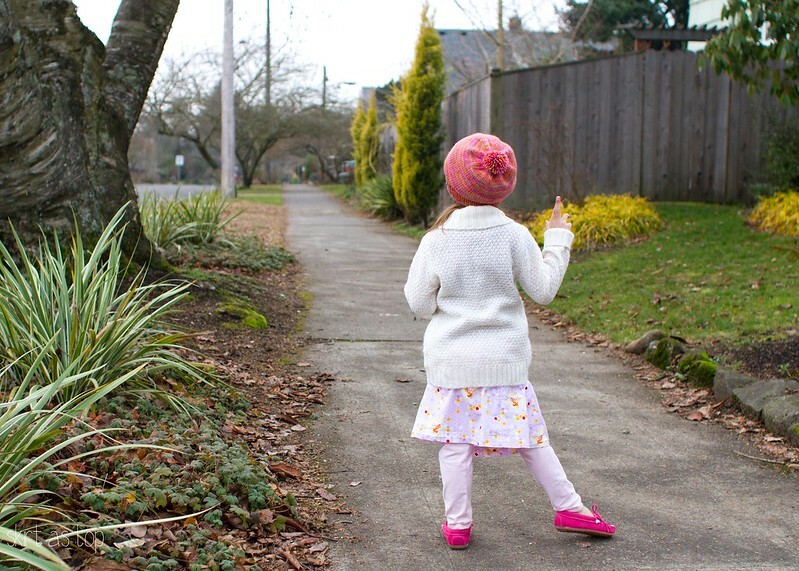 i should talk quickly about her skirt too – i made it for her first day of school and felt like it was too simple to blog on its own…but it goes so nicely with her hat, i figured i could throw it in here, okay? the fabric is the popular (with good reason!) briar rose by heather ross – hex bee in lilac. 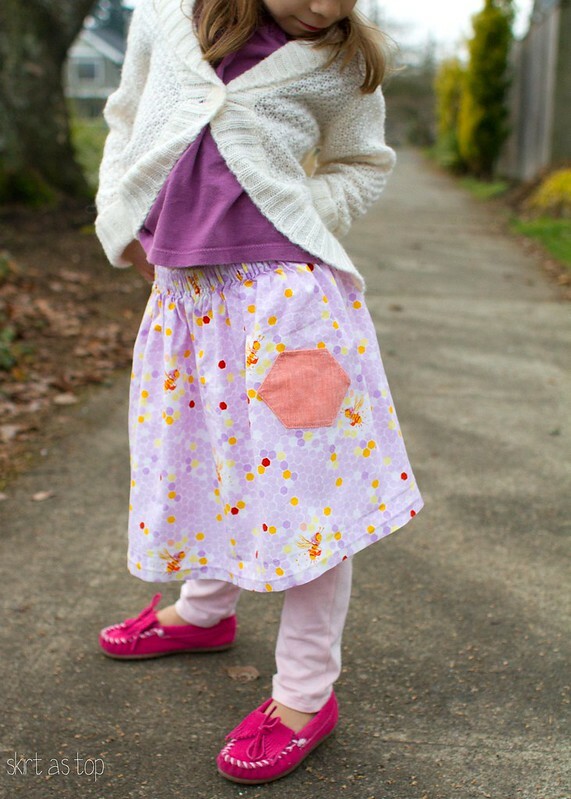 i basically sewed a lazy days skirt with no ribbon, and slapped a shot cotton hexi pocket on there for fun. she’s worn it quite a bit in the last few months. i keep thinking that, as a beginner, i should knit something bulkier, something with immediate gratification just to practice the whole process and get more projects under my belt, but i really like the look of the thinner yarns and the shapes those creations take, ya know? can’t help it. and i’m pretty much in love with this hat on top of her head. more hat details here on Ravelry. I love love the hat, it’s the perfect colors like you said. I can see her loving it. 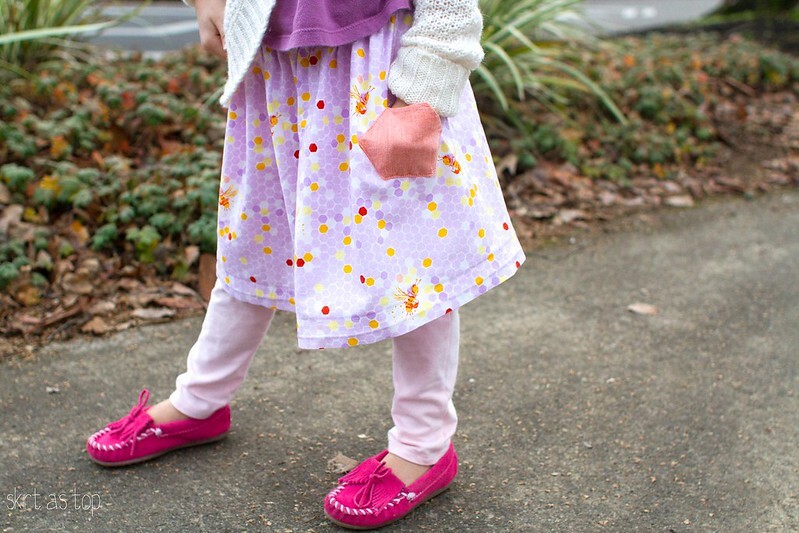 And the skirt/outfit, just like peas and carrots. Also, I”m so jealous of your outdoor space, it’s looks so cool. Like a movie. She looks so cute in her yummy looking yarn hat. I agree about liking the finer yarns. 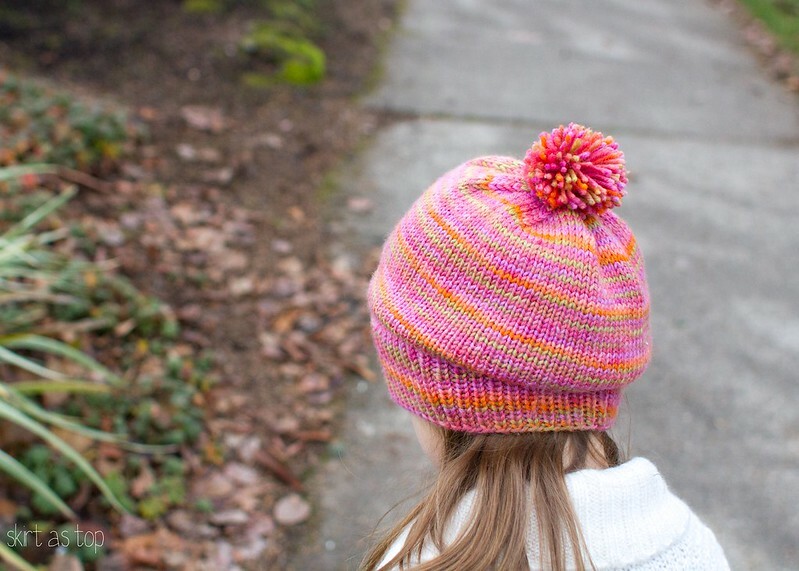 The hat I knit before coming to Oregon last year was with SOCK. It took a long time to show any progress, but it’s so delicate and the drape is nice. 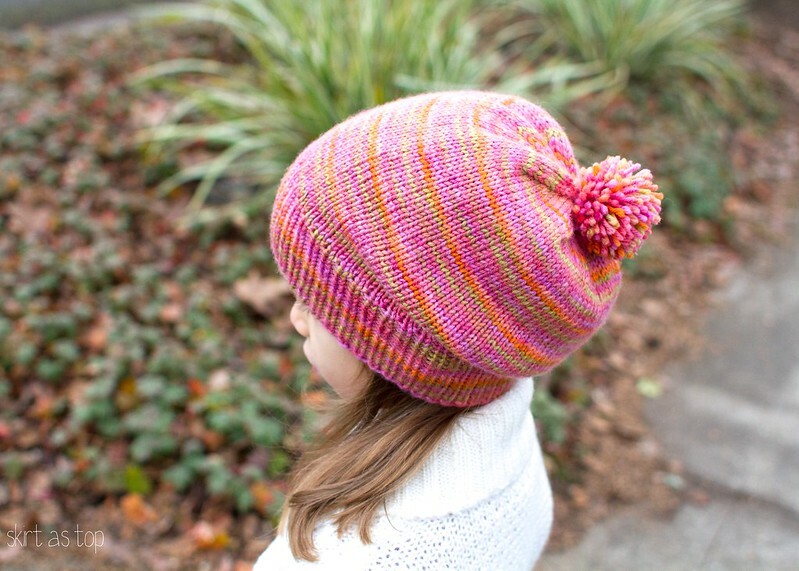 This is a fantastic knit hat – love how it drapes and I just adore her whole outfit. When it comes to yarn, I just buy what looks pretty and feels good and try to make it work – and if it doesn’t there is always something else to knit with it. But, I do like thinner yarns b/c I feel like I can see the stitching better. that yarn is delicious (and the one called “fruit salad” – i need something made from that!!) and Em is the cutest!! I love how you and your daughter have the same shoes! Beautiful work, Kristin! 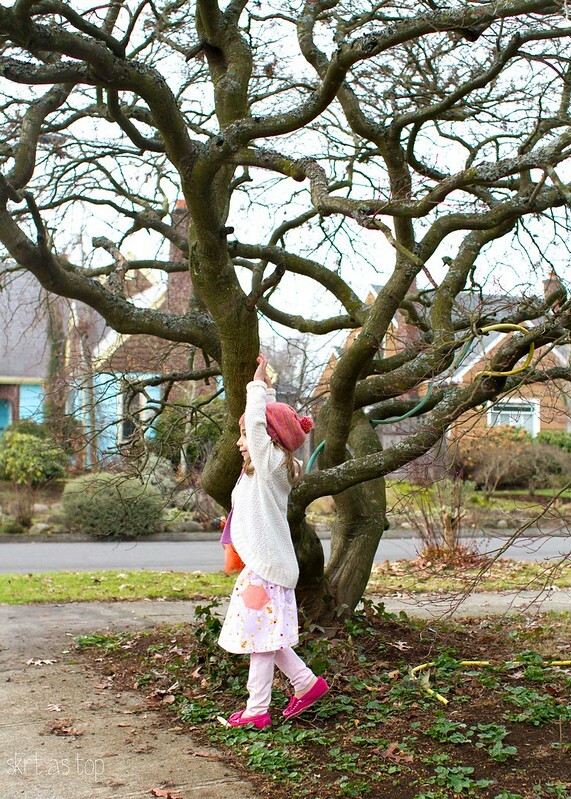 It sounds like you have the knitting bug:) I totally agree about the lighter weight fabric. Now, I think it’s time to cast yourself on a spring sweater. Do it! she looks like she belongs in the northwest! All of your knitting posts are giving me the courage to keep knitting! super cute hat!!! love that cutiepie. And I’m the “knit only with bulky” gal — love the instant gratification. Started a baby sweater in worsted that will probably be done when he’s 15. I love this hat! 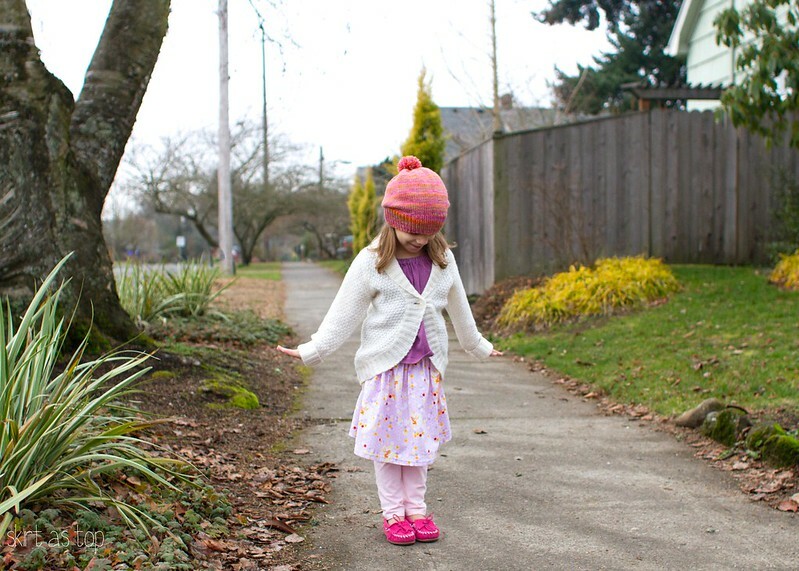 It’s so cute on her and your knitting looks so good, all nice and even…I haven’t bought any bulky yarns yet either, but I saw a sweater pattern that uses bulky and I am tempted. that is B-E-A-utiful. wow. I’ll have to watch you knit when we visit this year cause I’ve honestly never seen anyone knit in person before.